044a – Aliens | All Eighties Movies. All The Time! And thanks to The Undead Wookie for your help too! This entry was posted in Podcasts and tagged action, classic, scifi. Bookmark the permalink. As you can tell from my email rather big fan. Listened to all Alien podcasts and have to say your Aliens podcast is great. Few mistakes from Gidget but I appreciate her passion. Aside from that fantastic first half and can’t wait for second half. I saw your tweets Gidget and don’t worry! None of us are perfect. Your passion over casts your mistakes. Won’t point them out. Bring on second half. Well done Angry. 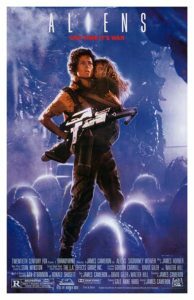 One of my favorite movies of all time but so is Alien. Excellent podcast. Can’t WAIT for part 2. Thanks Angry and Gidgit. I love your podcast. It’s now my regular weekly listening must! Read on twitter a competition for your 2nd half of Aliens. I’ll certainly be listening and hope I get in first. Love your pod cast by the way. Listened to several. Getting through all of them to work but Xanadu. My wife loves that movie. I can’t stand it. Oh well. Can’t love everything. But so pumped for part 2 of Aliens. thanks for letting us know you’re enjoying the podcast Robert – and good luck!